Pentax has announced a new stylish digital camera that is aimed at competing with the Canon IXUS cameras. The S1 comes in three designs – chrome with black trim, black with red trim, or green with silver trim. The Pentax cameras also has features such as 14 megapixel image sensor, 5x optical zoom lens (28-140mm), a 2.7″ LCD screen, and is able to capture 720p HD videos. The will be released in March 2011 and cost about $199.95 / £119.99. Pentax is pleased to announce the launch of the new Optio S1, a sleek compact digital camera which combines a unique design with outstanding functionality. At only 20mm thick, the Optio S1 is an ultra thin and beautifully designed compact digital camera. In addition, the Optio S1 is equipped with many advanced functions including a high-definition mechanically stabilized 14 megapixels sensor and a 5x wide-angle optical zoom. Furthermore, the Optio S1 is equipped with a high-quality HD video function, recording at 30 fps, easily viewable on a large 2.7’’ LCD screen. As well as a unique and sophisticated mirror-like finish, the Optio S1 has also been designed to be easy to use and provide great picture quality. The face recognition function, smile capture, blink detection and 22 different scene modes mean that you can almost leave it up to the camera to take the photos for you. The camera comes in 3 different colours, chrome, black and aquamarine green, to suit everyone’s tastes and outfit! The Optio S1’s chrome model combines a high-quality aluminium-alloy housing with a unique mirror-finish. The black and green models have also been treated with a gloss-coating. Each model comes with a lens barrel that matches its body colour, while all models feature laser-engraved logos. Thanks to the meticulous attention given to every single design detail, the Optio S1 is a stylish, beautifully designed imaging tool that is almost a fashion accessory. Despite its compact dimensions, the Optio S1 features an 5X optical zoom lens equivalent to 28mm wide angle to 140mm telephoto, in the 35mm format. Thanks to its wide zoom range, the Optio S1 can be used for a wide variety of subjects and scenes — from breathtaking landscapes, majestic architectural photos and group shots in confined spaces, to tightly cropped snapshots taken from a distance. When coupled with the Intelligent Zoom function, which allows even tighter zooming in on the subject, the zoom range can be extended to 33.5 times. Combining the exceptional image resolution of 14 effective megapixels and a state-of-the-art imaging engine with a high-performance PENTAX zoom lens and a reliable SR (Shake Reduction) system, the Optio S1 delivers brilliant, high-quality images with well-defined details. Even when enlarged to poster size, the images ensure sharp, high-resolution prints with excellent edge-to-edge sharpness. The Optio S1 incorporates an advanced CCD-shift-type SR (Shake Reduction) mechanism, which assures sharp, blur-free images even in shake-prone shooting conditions — such as when using a telephoto lens, or when shooting a sunset or indoor scene in incident light only — by effectively compensating camera shake for up to three shutter steps. When it detects low-lighting conditions in still-image shooting, the Optio S1 automatically raises the sensitivity to as high as ISO 6400, making it possible to use a higher shutter speed to effectively minimize the adverse effects of camera shake and subject shake under poor lighting conditions. 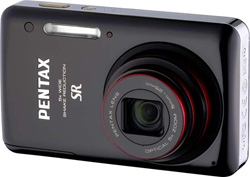 During movie recording, the Optio S1 prevents blurry images by using exclusive PENTAX software to digitally minimize any annoying shake of the camera. * When the High-Sensitivity anti-shake mode is selected, the recorded size is fixed to five megapixels (2592 x 1944 pixels). The Optio S1 captures beautiful, flawless movie clips at 16:9 high-definition TV proportions (1280 x 720 pixels)*** at a frame rate of 30 frames per second. It even comes with an independent Movie REC button on the back panel, so the user can start movie recording from any shooting mode without delay. *** When the Optio S1’s AV output terminal is used, movie clips are output at normal image size. If the user wishes to play back movie clips at high-definition-TV proportions (1280 x 720 pixels), the data must be transferred to a personal computer for playback. The Optio S1 features the PENTAX-original Auto Picture mode, which automatically selects the most appropriate shooting mode for a given subject or scene by accurately and instantly accessing all photographic conditions affecting the subject or scene. It detects 14 different subjects and scenes including people, landscape, blue sky and sunset, and instantly optimizes all camera settings such as sensitivity and shutter speed, ensuring the user sharp and beautiful images with minimal effort. The Optio S1 features a new-generation Face Detection AF&AE function, which instantly and accurately detects the subject’s face in the image field, then catches it in sharp focus and optimum exposure. It also comes equipped with other convenient features to make portrait and snapshot photography simple and effortless, for example the Smile Capture mode which automatically releases the shutter the moment the camera detects the subject’s smile. In addition, the Natural Skin mode reproduces natural, healthy skin texture. The Optio S1 comes equipped with nine digital filters, including Toy Camera and Retro, to add various visual effects to recorded images without requiring a computer. It also offers other creative tools such as the Miniature filter, which turns an actual scene into an image full of miniature models, and the HDR filter, which produces images with an extra-wide tonal range. Thanks to these creative tools, the user can create a wide variety of unique visual effects with very little effort. Available from all good retailers from end of March 2011. Trusted Reviews has tested a mono laser printer from Samsung with wireless connectivity. The printer is called Samsung ML-1865W and is able to print up to 18 pages per minute, or so Samsung claims. Trusted Reviews ends up giving the ML-1865W a very good review with an overall score of 9 out of 10 possible points and even a “Trusted Reviews Recommended” award. The Samsung printer scores highest on value for your money, prints speeds and print quality, while it scores a little lower on features. If you are on a budget a needs a mono laser printer and you do not have the biggest print tasks these printer from Samsung might be your perfect choice. 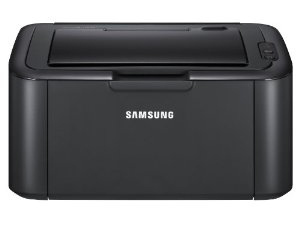 Read the full review of the Samsung ML-1865W wireless mono laser printer here.